From 13:00 to 16:00 there is lot of time for meetings. We will try to announce them on site. You’re welcome to get into the #lgm irc channel on freenode and organise activities during the LGM. If you announce them to us, we will also add them to the Website. The ColorHug was announced in November 2011 as a 100% open source colorimeter device. The first 50 prototypes were lovingly hand soldered by myself and assembled by my wife in our spare bedroom. Since then, we've shifted from small hand-made batches to automated machines and started making production quantities. The community has welcomed the open hardware, with a vibrant community fixing bugs and adding new features and the project has blossomed into a healthy ecosystem. This is my first foray into producing open source hardware, and in this talk I'll explain the first-hand experienced intracacies of setting up an open hardware company, and what direction I see the project going in. We'll cover topics like automated firmware upgrades and complicated things like CCMX files, but without getting too bogged down with all the calculations. I'll show lots (and lots) of pictures and will try to avoid writing any words in my slides. I'll show all stages of development, from breadboard to automated pick and place machines, along with all the new software UIs and try to keep the talk lighthearted and fun. There will be time left for questions and discussion. Many people interested in colour are taking part on OpenICC and think about getting Linux CM right or at least better. The talk will summarise some of the recent discussions. SVG 1.1 is now widely implemented, and has some (minimal, optional) support for ICC colours. In the main though it is an sRGB system. SVG2 adds a conformance class for full ICC support (v2 and v4) including named colours, direct specification in LAB or LCHab, and interpolation in LAB or LCHab. Unmanaged device-specific colour is also supported. The talk will dive into the usability and technical concepts of a cross platform colour management system and comment on some myths and facts around it. The colord project has had an amazingly successful year, and is now installed by default on the Fedora, OpenSuse, Ubuntu and other distributions. In this talk I will quickly introduce why color management is important and then outline the many new features that we've introduced over the last 12 months, including automatic device to profile matching, native sensor drivers and the new profile metadata that is supported by GNOME Color Manager and some other tools. I will outline the future direction of colord, and hopefully try to explain my vision of a color management framework that "Just Works". Re-lab project. Formats reverse engineering: tools and results. Insight on re-lab's reverse engineering tools and their usage to implement/improve support for proprietary file formats in your program. Progress report on latest achievements. The talk aims at presenting the recent graphic import filters additions to LibreOffice. It will show the feature coverage and the way we developed them. The method allowed us to do quite substantial progress in short time. The APIs used will be also presented briefly. sK1 project has been a bit silent for the most of this year. This is basically because we started it all over again. A year ago we decided to introduce major changes to both sK1, the vector graphics editor, and UniConvertor, the vector graphics conversion tool. After some analysis the decision was made to start everything from scratch although initially the plan was to do refactoring of both sK1 and UniConvertor. This decision didn't come out of blue, because the source code inherited the architecture from Sketch/Skencil which was fine for late 90s, but didn't really resolved development issues for 2010s. Given amount of code base to go through we decided to just redo everything from start. That wasn't by any means an easy decision to make, but it was the only way out, especially since supporting the old toolkit was starting to take too much time. Mere 2-3 years ago we still had some hopes for Tcl/Tk 8.5-8.6, but alas it was a defeat. So we also had to find a new toolkit, and the choice was between GTK+ and Qt. Finally we have selected Gtk widgetset. Architecture was another issue we had to deal with, since we used to support sK1 and UniConvertor as two separate projects using duplicated code base. Also we designed a new file format appropriated to new document model that is modeled after OpenDocument and called it PDXF (PrintDesign XML Format). Just like OpenRaster or OpenDocument files it's a ZIP archive with content.xml that describes the structure and nested folders for each type of embedded data. GLyphy is a new, OpenGL-based, text rasterizer that I have been working on. In this first public presentation about GLyphy I will discuss the design, challenges, and benefits of such a approach to text rendering. The algorithms involved may prove to be useful in other computer graphics contexts as well. World Welder is a solid modeler project based on the new "advanced half edge mesh" technology, World Welder introduces Ring Modeling, a powerful technique suitable for either interactive or automated modeling. Tightly coupled to a real time simulation engine with C/C++plugins. Lua scripting to automate modeling. Multiple viewports. GLX or optional QT host with dynamic widgets. Mesh compiler to optimize rendering. CAGL interface. Computational geometry kernel includes subdivision surfaces, mesh/plane booleans, mesh hit detection, contour maps, mitre joints, bevels, much more. Written in C++11. Currently under heavy development; now capable of generating various 3D media assets online or offline; heading towards rich subdivision modeling and animation support. License: GPLv3. Now inviting participation from interested developers. Last year, we were still celebrating the appearance of @font-face, allowing for the first time the use of non-standard typefaces on web pages. The explosion of libre work in typography thanks to initiatives such as the Open Font Library, the League of Movable Type or Google Web Fonts has been remarkable. Ana and Ricardo from Manufactura Independente will drive you through the history and recent developments in libre typography and type design, while providing many hints, technical hacks and advice on how to make the most of your designs; there will be a special focus on where and why using fonts and software that respect your freedom can elevate your design practice. iScriptDesign lets you create images in an untraditional way: "Thou shalt script".With a script in your sketch, everyone can experience interactive, animatable and parametric online graphics. And that's only the start! Imagine online parametric blueprints for 3d printing, or cnc routing. Instead of carving dimensions in rock, let the customer adapt it to his needs.Using iScriptDesign you'll never ever experience a leaving customer who is in love with your design but not with its the dimensions.You will see how iScriptDesign not only solved some of my day to day problems, but how it can also solve your problems as well. Digital Painting with open source. My talk is about what we already have in opensource, like Gimp, Mypaint, Krita... and has videos, examples of works. and a presentation. Is not attached to an specific software and is for mid-users Is about Creative proccess and how we can explore ideas with the software. technically correct, but not quite predictable or expected. available, but they are not always obvious or convenient. This talk is a summary of a past and ongoing discussion. Current state of Laidout, including various new on canvas tools, and 3-d shapes. to a system which is not well integrated. the configuration to the programmer and the administrator. Let's broaden the view of your digital camera. We will do some beginners steps with our own cameras and the well known panorama software and get around the most common pitfalls. Tripod is helpful. This workshop is to discuss and practice laying out graphics on various things that are easily made physically, whether books or 3-d shapes. Will demonstrate with a combination of Laidout, Polyptych, and other programs to help at various stages. personpower, or even outright replacement? It's just something I hear come up a lot, usually not in a positive list, and not infrequently in close proximity to expletives. Obviously there are other application types that rely on SANE or scanner access in general (e.g., OCR) that would have different requirements, but the graphics projects certainly deal with it more frequently. My apologies if you're a huge SANE fan, but I see a lot of individuals complaining about different aspects of the design and the API -- it probably can't hurt to have that discussion in one place and see what comes out of it. HarfBuzz is the Free Software text shaping engine. It is currently in use by GNOME, KDE, Firefox, Chrome, and Android among others. A collaborative effort was started years ago to rewrite HarfBuzz for better stability, performance, and maintainability. The effort has been know as harfbuzz-ng. I this session we will present the current status of harfbuzz-ng, what's been done, what still needs to be done, and what the challenges are. Design and performance considerations will be discussed. Free software designers don't have a great set of integrated tools to work with to collaborate with each other and with the community on designs. We've come farther since the GNOME UX hackfest in 2010; let's make more progress towards fixing that. We'll review and demo the existing tools we do have, talk about their current status. and we'll also present our ideas for tool integration and further expansion and new tools. (1) Sparkleshare: a git-backed, Dropboxlike system that automatically checks in and pushes files to a shared git repo. (3) Design Hub: an idea and a rough ruby on rails prototype of a web interface that could potentially serve as a front end to Sparkleshare-backed git repos with design assets as well as serve as a front end to magic mockup assets. (4) Inkscape: We have many integration ideas for workflows between Inkscape's GUI and Magic Mockup, Sparkleshare, and Design Hub. With this talk I want to underline the importance of collective design process and to point out some proposal for the development of tools that enable the collective design of communicative artefacts. The study of popular spontaneous collective processes could be an important element for the development of enabling tools for collective design. The online community has find out many solution to overpass technical restraint linked with co-creation (e.g. Youtube and the difficulties of re-editing videos by other users), but still there is a lot to do for helping this need of collective creation. A lot of other insights could be obtained from the notes of tutors and designers during workshops or teaching experiences: from real problem to interesting solutions. The ideas exchange between software developers and designers can help developing solutions to encourage people to construct a collective discourse more than an individual monologue. UpStage is an online platform for the real-time collaborative manipulation of digital graphics and other media into live performances for online audiences. The original software is now 8 years old, and during the last year developer Martin Eisenbarth has proposed a base concept and software architecture for a new engine, called DownStage, that will drive UpStage and potentially other variations of the platform as well. As UpStage is an unfunded and independent artists' project, we are seeking ways to support this development, and one source of support has come through a collaboration with the French digital artists' collective APO33. In this talk Helen will give a brief introduction to UpStage, then Jenny will talk about APO33, their FLOSS developers' residencies and the collaboration with UpStage. Martin will then introduce the new engine, DownStage, and outline the ideas that motivate it, which include aiming for a modular and extensible structure that will more easily enable other developers to get involved. A 5 minute "lightning performance" to demonstrate cyberformance using the online platform UpStage, featuring remote performers. With the advent of Live Path Effects (LPEs) and especially the pattern-along-path LPE, it became possible to edit a path's stroke width live on-canvas. The pattern-along-path LPE was however not designed for variable stroke width use, resulting in a very awkward UI experience. Powerstroke is the name of an upcoming LPE dedicated to variable stroke width. The talk will start with a brief introduction to LPEs, how they work and what they can and cannot do, followed by a detailed discussion of the new Powerstroke LPE. The role of text within GIMP work ranges far beyond the text tool. However, the handling of text had never received any interaction design love… that is, until the beginning of 2012. That is when the GIMP UI design team ran a text handling design project, where solutions were methodically designed based on the right foundations. Kate and Peter will show the steps the UI team took, and how much a deep understanding of GIMP, GIMP work and users informed the work. Besides that there will be plenty of take away points for other Libre Graphics projects. acceleration to the General Graphics Library (GEGL) and the GNU Image Manipulation Program (GIMP). I intend to show the current state of the project, some implementations techniques used and performance comparisons among common GPUs. GeglBuffer tight and flexible raster abstraction. GeglBuffer is a powerful framework providing a clean abstraction to pixel storage. It has a small public API, architecture, GPU integration, pluggable backends and extendable color models, pixelformats and conversions using babl. Pluggable tile backends allows integrating GeglBuffers transparently with on top of existing pixel buffer data types, remote buffers, online map services or even to do on demand fractal rendering. A brief introduction about GEGL-based GIMP. Without really planning for it, we happened to port the GIMP core to GEGL. This talk will give an overview about some new concepts in the GIMP core and on the plug-in side. Colorfont.js is a jQuery script we developed to allow multi-coloured typography on the web. Along with the script, we designed a set of alternates to existing libre fonts for use with this library. One approach to create coloured type is to make variations around existing libre fonts. These variations are intented to use as overlays to the original, extensions to existing typefaces.A project such as this is only possible in the context of libre fonts and libre graphics, since creating and redistributing modified versions of fonts is a fundamental premise. In this spirit we propose a workshop around multi coloured type. We'll start with an overview of coloured type in graphic design, in order to collectively plan and sketch a set of new colorfonts to be created on the workshop. From there, we'll be making good use of Fontforge, Inkscape, Python scripting and Git version control in order to collaboratively build and release new designs for use with Colorfont.js (and many other tools!). Using CREATE's web presence as a resource site, both for developers as they discover the creative app universe and for artists/designers interested in learning more. It would at least be worth a site hacking session at LGM this year. What CMS/framework is used for that is probably not as important as getting the content right, of course. This should happen after the "Re-imagining UpStage" presentation: a work session where Martin will explain DownStage in more detail and interested people will be invited to brainstorm topics including: setting up an environment for development; running prototype basics (XMPP real-time messaging, video-streaming, REST-API access using different programming languages); and discussion about development, design considerations and uses of the platform. A workshop explaining how to program using lib2geom, the geometry framework library that is used by Inkscape. I will briefly introduce the main lib2geom concepts, and show many examples of how it is used in Inkscape. After that, I'll try to answer any questions. Kai-Uwe Behrmann, This is the request for a BoF/Workshop. Visualise and explain the effect of rendering intents as well as proofing profiles. Free and Open Source Software lives via the collaboration of many people with different views and opinions on things. Art and design work can also be created in a collaborative manner. Working together on art and design work for free and open source software can seem an impossible thing to do, however. This talks will explain how art and design work is done in the context of particular FLOSS projects and the types of challenges free and open source design contributors face. The work at the Libre Graphics Research Unit (LGRU) is now almost halfway. Since June 2011, the Unit functions as a traveling lab where new ideas for and about creative tools are developed. LGRU is an initiative of four European media-labs actively engaged in Free/Libre and Open Source Software and Free Culture. With this presentation we would like to give you an overview of what has happened sofar. 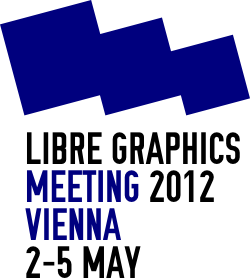 More inportantly we would like to talk to you about why and how we think LGRU can be of use for future Libre Graphics. Wiki Loves Monuments is a photography contest organized by Wikimedia, in 2011 it collected over 170000 freely licensed photos of hystorical monuments from Europe. In 2012 it will go beyond Europe, with many other countries participating. Bassam demos the recent work of 3D animation group, URCHN, showing through images and video how F/LOSS can be used to build ambitious films organized around access rather than artificial scarcity. ‘Open Movies’ are a continuation of the free/libre open source development model into the realm of media production. The open movie process delivers not just a film, but an entire production pipeline using Blender and Python for new custom tools, Mypaint, GIMP, Krita, Inkscape, Ardour, Ogg, Linux and more. Elephants Dream, the original open movie Bassam directed, proved it possible to make high quality 3D animation using libre tools in a studio setting. The Tube Open Movie is a new experiment, this time in distributed collaboration — a love letter to free software and open culture that marks their convergence with independent filmmaking. Lukáš and Timothée will introduce soon to be released Krita 2.4. Timothée will practically demonstrate cool new features in Krita while Lukáš will talk about technical side of those features. Main topics will be what's new in Krita, what can it offer to professional painter and what is still missing and has to be done. In the end we will show stunning art made with Krita. Synfig studio is a cool vector animation software. Through a small screencast, I want to show the basics of how to use it, and present some fun new features. Also it will be a good occasion to talk about its current development status (upcoming features, call for contributions, collaborations with other projects…). In this talk I'm going to introduce Remake build system that is used to maintain rendering for animation projects created with Blender or Synfig Studio. I will share some of my experience in animation projects development, outline the problem of rendering complex projects and demonstrate Remake as solution (with live examples). Remake is an opensource software. Homepage: http://morevnaproject.org/tag/remake/. In this presentation I will talk about the main challenges we are facing in Synfig development and how we plan to solve them. I want to make a workshop showing some workflow to create illustrations and comics with Krita. Free and open source software can used for everythin now. If you not believe that, you should visit this workshop. Of course you should also join it, if you like to learn using Krita, Mypaint, Gimp, Inkscape and Scribus. The target of the workshop is preparing a book with this tools. This book will be printed and available on amazon, so what you produce in the workshop will be in it. There will be several working groups, you can join. One group will prepare the cover using Krita, Mypaint and GIMP. and last but not least there will be a group working with Scribus putting everything together, so that it becomes a book. Graphic design is an aggregative art and has a huge function in its international field. But, in Iran there isn’t any correct understanding of that because the different branches of this amazing art has not separately been defined and utilized to make the people see and receive its visual presence and affect in their life environments. The graphic designer has to be like a working machine and does work in all of the branches alone to propound the functions in society. Although the designer knows all of these branches, such as designing a logo, they are not supposed to be included in her work experience, because each of those requires academic professional experience. On the other hand, the communications has taken a special new visual form these days and although the Iranian designers haven’t still reached such technical development in the framework of graphic design profession, they have to follow the global direction and use digital technology but, the presence of digital technology has forced them to almost quit working with the previous tools and equip themselves to this new one, because the mentioned presence has been put into work before creating a suitable ground of acceptance for it. This occurrence has made the situation worse. Old hand designers have lost their jobs and even though just a few of them could have learnt skills in this regard, the power of computer is completely at the hands of young generation. Even though the history proves that they could have connected themselves to the global network, they have failed in some grounds. There still haven't been stated different specialties and management graphic design careers as if some people would like to call themselves “Art directors”. According to my research, some solutions can be offered for this problem. Many artists fear making a transition from proprietary software platforms on which they have honed their skills into the world of Libre Graphics software. In this talk I will outline a process to develop a complete studio work flow around Libre software tools from project ideation to management to production. In addition archiving will be addressed. In addition I will give examples on how to teach the workflow to your artist peers and students. Strategies and a time-line will be explained along with work examples. I made the transition myself starting at LGM 2010 and want to share my experience and knowledge with other creatives. This talk is a tour of new open source software tools for font development that have been released over the past year. Several independent projects have seen the light of day during the previous 12 months, each adding different features to the arsenal of free software utilities. The heavy hitters includes Google's sfntly, the typography extensions for Inkscape, and newly GUI-empowered ttfautohint. We can look at how each one contributes to the font development workflow, as well as where they are headed next. Summary of this year's LGM and plans for next year's one.